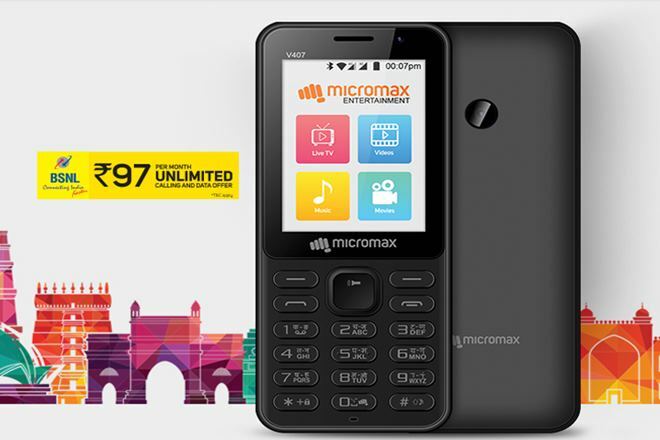 Micromax today launched its JioPhone rival, dubbed the Bharat-1. Micromax Bharat-1 Feature Phone With 4g VoLTE Support Launched for Rs.2,200. The feature phone has been launched in partnership with BSNL, a telecom operator that does not offer 4G services in any circle currently. BSNL will be offering unlimited calls as well as data to Bharat-1 users for just Rs.97 per month. The Micromax Bharat-1 has been priced at Rs.2,200 and only comes in a single color – Black. The Micromax Bharat-1 runs on Qualcomm’s 205 mobile platforms and features a 2.4-inch 320 x 240 QVGA resolution display. Keeping the lights on is a 2000mAh capacity battery, identical to the Reliance JioPhone. BSNL is one of the major service providers in the country and has a vast reach and network that spreads across every nook & corner of the country. Both Micromax and BSNL have been working with an aim to bring the next wave of unconnected users on the Internet. We will now take this vision forward with Bharat-1 and create a compelling proposition for the users that is a first in the category, said Rahul Sharma, Co-founder Micromax. We are proud that we are partnering with Micromax, a home-grown player which has been a key player in India’s growth journey and has contributed more than 150 million mobile users and this number is ever increasing. Connecting the last mile- to the Internet and relevant information – is an important part of the strategy for both BSNL and Micromax. We are confident that Bharat-1 will help millions of users experience the data and call experience like never before, said Anupam Srivastava, CMD at BSNL. Micromax Bharat-1 feature phone with 4G VoLTE support launched for Rs.2,200. Let us know if we out something about Micromax Bharat-1 Feature Phone With 4g VoLTE Support Launched for Rs.2,200 via comments below.